Sitting in the Seattle airport at 5:00 am is not my idea of a fun time. At least I got a free upgrade for the flight between Anchorage and Seattle. Unfortunately, the flight wasn't long enough to get much sleep. The flight from Fairbanks to Anchorage was on AS 52, and was a combi (half freight half passengers). I sat next to a couple on vacation returning from a couple of days in Barrow. They were telling me all about the tours they took and had a lot of questions about the aurora. Fortunately, I still remember some of the physics of the aurora from my grad student days at the university. I'm on my way to Oregon to spend some family time. The farm where my dad grew up has been sold in California and I'm meeting up with other family members for a time of sharing memorable experiences on the farm. I modified the Google Latitude settings to show more accuracy and downloaded an app called Longitude on my phone that will do updates automatically based on a schedule. When we actually head down the road, I was going to increase the update frequency and see how well it works. 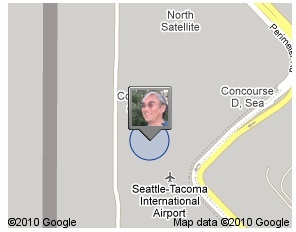 Right now it shows me sitting in the middle of SeaTac. When I tried it at the University, it had me sitting at a cell tower. I guess the gps couldn't get a good location. On the drive down to California, the problem will be AT&T data availability. I've managed to got in some riding since I've been back from Barrow and have been trying to focus more on my cornering. I noticed that this summer, I've been reluctant to lean very far. I guess I don't trust the link between the tires and the road. This has been especially true with the wet roads we've had lately. I picked up Proficient Motorcycling by David Hough at the rally and started going through it while in Barrow. Lots of material there and not enough of a riding season to practice. 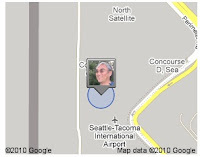 Interesting, I'm at PDX and Google Latitude has me across the river in Vancouver, WA. Maybe that's the nearest cell tower. Probably no gps signal inside the airport. Amazing! There is wireless network access on the HUT Shuttle to Corvallis. I didn't expect that at all. Unfortunately, that means that I'll not get much sleep on the 100 mile trip. I'm starting NOT to feel sorry for you anymore. I thought you had a short riding season, and a short summer with limited road options. BUT you travel all over the country. It's almost time to purchase another bike and store it in Corvallis. We also have a long weekend up here. If you had a bike, we could have met somewhere in the middle, perhaps Seattle for a day or so and ridden into Central Washington, or even southern WA. I just love Palouse county (South of Spokane), or else in the Gorge, Around Stevenson, WA there are great roads down there. Saturday Morning Coffee at Coffee Culture Annex on 9th @ 9:00, next to Highland Bowl. Hope to see you there. Also let me know if you're up for a ride this weekend, we might me able to scrounge up an extra bike. Thanks for the invite, but I'm in southern Oregon now heading for central California. Be back in Corvallis Monday night and leaving Wednesday by noon. Pretty quick visit. I've thought about the leaving a bike in Oregon before but given the maintenance older bikes seem to require, I sort of ruled that out. Plus, I'm not down here that often. I think that this is the second time this year. Usually, there is more time elapsed. Only one day in Corvallis before heading south and only one day before heading back north. I'll wave as I pass Vancouvef next Wednesday.